Must have experience traveling internationally -either solo or with a group; should have 5 or more years professional experience. A positive attitude, ideas on where you want to go and what you want to do, and a desire to really travel the world; pens. Ready to quit your job and travel the world? Heard of a “gap year,” but don’t know where to begin? Think you have to win the lottery to do so? Awaken your inner explorer by planning an affordable big trip around the world. 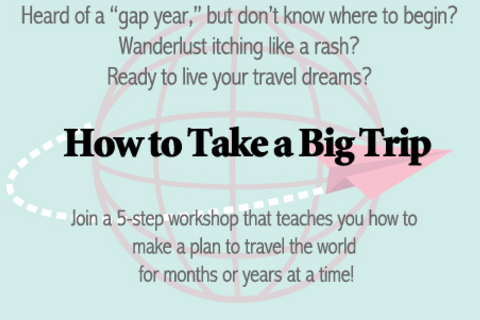 In this workshop, Kristin Zibell, world traveler and founder of TakeYourBigTrip, will take you through 5 steps to plan your own "gap" year. You'll create a plan to travel the world, complete with next steps towards your trip. The format of the workshop is collaborative & interactive. At the start of each section, Kristin will cover foundational information and then give you several exercises to create your plan. + Envision It: Create a vision of your dream trip. + Define It: Write your itinerary that spans the globe. + Afford It: Determine a trip budget and see how affordable it really is! + Plan It: Review your life and create actionable steps to get you to your departure day. + Do It: Get questions answered and find your travel community! Kristin Zibell is a world traveler who teaches others how to live their travel dreams. She authors the blog Takeyourbigtrip.com, a site of resources to help travelers to take their own multi-month and round-the-world-adventures. She has inspired hundreds of would-be travelers to plan their own big trips as a speaker at the World Affairs Council, Travel Massive, Gogobot Travel Salon, Asia Society, and Meet Plan Go. Kristin has written about her experiences on AFAR.com, Bootsnall, NomadicMatt, Fathomaway, and Best Women’s Travel Writing. An international traveler since her youth, Kristin took her own big trip between 2008 and 2010 to India, Southeast Asia, the Middle East, and Europe. Kristin now lives and works in San Francisco in the travel and tech industries. She believes traveling long-term makes Americans better global citizens and that long-term travel is a way to begin living the life you want.